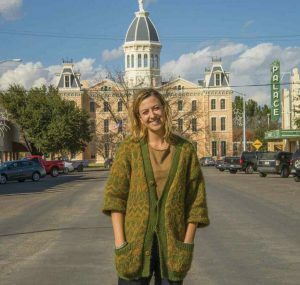 When freelance writer Rachel Monroe '06 went searching for a place to call home, she settled upon a remote little town in the high desert of West Texas. Here's why. THE EASIEST WAY for non-Texans to get to Marfa, Texas, is to fly into El Paso. From there, it’s a three-hour drive, the kind that turns shoulder muscles to stone from the sheer effort of holding the steering wheel on a straight and steady course for so many miles at a stretch. And when you finally get there, it looks pretty much like any dusty, dying West Texas railroad town. Except for the fact that Marfa isn’t dying at all—in fact, it’s thriving. You may have heard of Marfa. In the past few decades, it’s gained a kind of quirky fame among art lovers. As a writer with an interest in the arts, Rachel Monroe ’06 was familiar with the name back in 2012 when she set out from Baltimore on a cross-country trek in search of whatever came next. At the time, she assumed the little town was probably located just outside of Austin, but as she discovered, it’s actually more than 400 miles farther west, way out in the middle of the high desert. After a long day’s drive, Monroe spent fewer than 24 hours in Marfa before moving on, but that brief rest-stop on her way to the Pacific would change her life. So she began to write essays, and something clicked. Essay writing immediately struck her as a more appropriate form for exploring the ideas that excited her, and after years of rejected short stories, as an essayist she found quick success. Being published was good. Caring about what she wrote was great. Doing research was fun. And she no longer felt like she was faking it. Suddenly, she was off and running on a new, entirely unexpected career in nonfiction. After completing her MFA, she stayed on in Baltimore for a couple of years, writing for a website run by fellow Sagehen Susan Dunn ’84, called Baltimore Fishbowl. And then, she simply knew it was time to move on. So she packed up her car and drove west. ACCORDING TO THE Texas State Historical Association, the town of Marfa was founded in 1883 as a water stop and freight depot for the Galveston, Harrisburg and San Antonio Railway. The rail line slices straight through the heart of town, and a couple of times a day, seemingly endless freight trains come barreling through. The landscape here is flat and barren, covered with sparse grasses and low vegetation like creosote and yuccas, so you can literally see the train coming for miles. But the trains don’t stop here anymore, and their only apparent contribution to the local economy is a negative one—the cost of earplugs provided to guests in a nearby hotel. Back in the 1940s, the town’s population topped out at about 5,000, bolstered by a prisoner-of-war camp and a military base. When those vanished after war’s end, Marfa seemed destined to slowly fade away, like so much of small-town America. But in recent years, the town’s population has stabilized at around 2,000, thanks to the two rather discordant pillars of its modern economy—arts tourism and the Border Patrol. 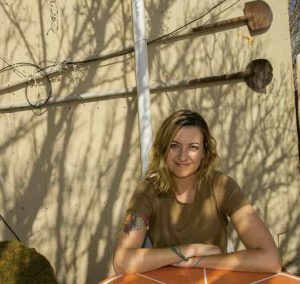 In Marfa, exhausted from her eight-hour drive from Austin, she crashed at El Cosmico, a quirky hotel-slash-campground where visitors sleep in trailers, teepees and tents. The next day she took a tour with the Chinati Foundation, one of two nonprofits—the other being the Judd Foundation—that promote the arts in and around Marfa. Then she drove on. But she couldn’t quite leave Marfa behind. Since she hadn’t been able to write much on the road (“It’s hard when you’re sleeping on friends’ couches”), she decided to return to Marfa and find a place to settle in for a week or so and write. THE BORDER PATROL has been an integral part of life in Marfa since 1924, when it was created by an act of Congress—not to control immigration, but to deter the smuggling of liquor across the Rio Grande during Prohibition. That mission soon changed, however, and today, the Patrol’s Big Bend Sector—known until 2011 as the Marfa Sector—is responsible for immigration enforcement for 77 counties in Texas and 18 in Oklahoma. Headquarters for the whole sector is just south of town, near El Cosmico, and uniformed Border Patrol agents are a conspicuous presence in Marfa’s coffee shops and on its streets. According to the sector’s website, it now employs about 700 agents and 50 support staff. Among them, Monroe says, are quite a few young men and women who grew up right here in town. The other pillar of Marfa’s economy doesn’t jump out at you until you walk up Highland Street toward the big pink palace that houses the Presidio County Courthouse. Glance inside the aging storefronts, and where you might expect to find a Western Auto or a feed store, you’ll find, instead, art gallery after art gallery. The story of Marfa as a destination for art lovers begins in the early 1970s with the arrival of minimalist artist Donald Judd. Drawn to Marfa by its arid landscapes, he soon began buying up land, first the 60,000-acre Ayala de Chinati Ranch, then an entire abandoned military base. In what must have seemed a grandly quixotic gesture at the time, he opened Marfa’s first art gallery. Then something strange and wonderful happened. Artists began to gravitate to this dry little West Texas town to be part of a growing arts scene, and behind them, in seasonal droves, came the arts tourists. 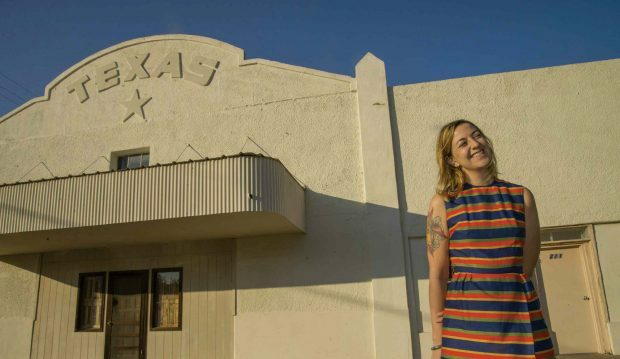 Some of those stories, which increasingly have appeared in prominent national venues like The New Yorker, New York Magazine, Slate, The New Republic, and The Guardian, have grown directly out of her engagement in the Marfa community. In fact, the article that really put her on the map for national editors happened, in large part, because of her decision to join the local fire department. A year later, when a fertilizer plant exploded in West, Texas (“That’s West—comma—Texas, which is actually hours east of here”), Monroe found that her status as a first responder was her “in” for an important story. In the course of the investigation, a firefighter named Bryce Reed had gone from local hero to jailed suspect. Monroe wanted to tell his story, and her credentials as a fellow firefighter were key to earning his trust. The 8,000-word piece, which appeared in Oxford American in 2014, helped shift her career into high gear. Despite her usual writer’s insecurities about making such a claim herself (“As soon as you say that, a thunderbolt comes and zaps you”), she hasn’t looked back. THAT DESCRIPTION—a wall I can’t see over—might also apply to how I feel about Marfa as I walk up its dusty main street. From a distance, today’s Marfa seems to be a strange composite—a place where down-home, red-state America and elitist, blue-state America meet cute and coexist in a kind of harmonious interdependence. As I walk, I see things that seem to feed that theory—like two men walking into the post office, one dressed all in black, with a shaved head and a small earring, the other in a huge cowboy hat and blue jeans, with a big bushy mustache and a pistol on his hip. But at the same time, I’m struck by the sense that there are two Marfas here, one layered imperfectly over the top of the other, like that old sky-blue Ford F250 pickup I see parked in the shade of a live oak, with a surreal, airbrushed depiction of giant bees stuck in pink globs of bubblegum flowing down its side. Monroe quickly pulls me back to earth—where the real Marfa resides. Monroe is quick to point out that the advantages conferred by Marfa’s unique niche in the art world are part of what makes the little town so livable. That’s why she’s able to shop at a gourmet grocery store, attend a film festival and listen to a cool public radio station. “You know, I don’t think I could live in just, like, a random tiny Texas town,” she admits. After all, a person who follows her intuition has to keep her options open. 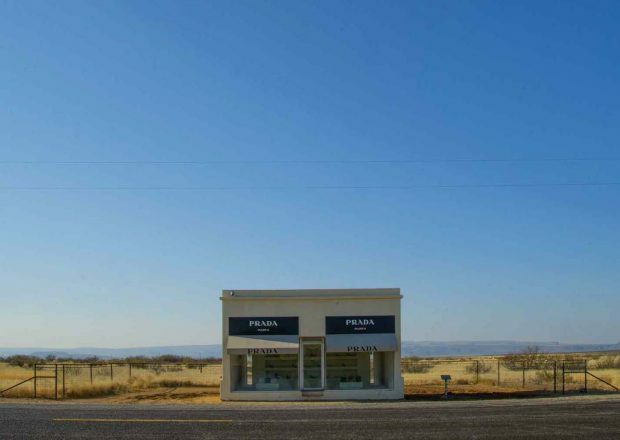 LEAVING MARFA, I stop for a few moments to take in one of its most iconic images—a famous art installation known as Prada Marfa. If you search for Marfa on Google, it’s the first image that comes up. And a strange scene it is—what appears to be a tiny boutique, with plate-glass windows opening onto a showroom of expensive and stylish shoes and purses, surrounded by nothing but miles and miles of empty scrub desert. Looking at it before I made the trip, I thought it was a wonderfully eccentric encapsulation of what Marfa seemed to stand for. Here’s the irony—it’s not really located in Marfa at all. It’s about 40 miles away, outside a little town called Valentine. But I suppose “Prada Valentine” just wouldn’t have the same ring.